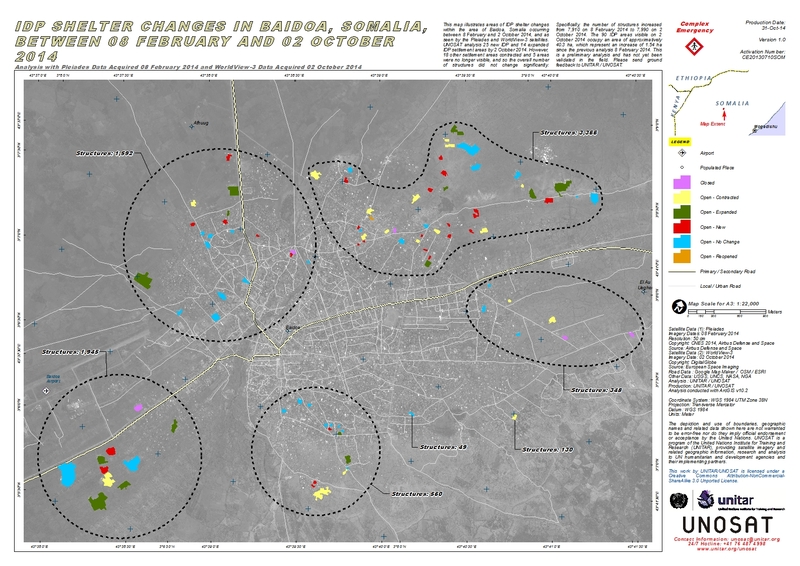 This map illustrates areas of IDP shelter changes within the area of Baidoa, Somalia occurring between 8 February and 2 October 2014, and as seen by the Pleiades and WorldView-3 satellites. UNOSAT analysis 25 new IDP and 14 expanded IDP settlement areas by 2 October 2014. However, 18 other settlement areas contracted and 5 areas were no longer visible, and so the overall number of structures did not change significantly. Specifically, the number of structures increased from 7,910 on 8 February 2014 to 7,990 on 2 October 2014. The 90 IDP areas visible on 2 October 2014 occupy an area of approximatively 40.3 ha, which represent an increase of 1.54 ha since the previous analysis 8 February 2014. This is a preliminary analysis and has not yet been validated in the field. Please send ground feedback to UNITAR / UNOSAT.